Published: Jun 15, 2015 · Modified: Sep 8, 2018 · By Jen Sobjack · This post may contain affiliate links. 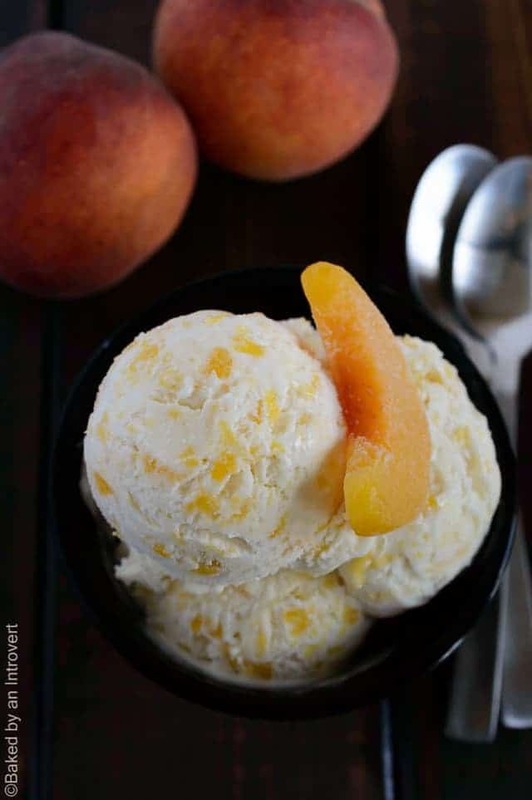 No churn peaches and cream ice cream made with only 5 ingredients. You’ll crave it all summer long! Say hello to the simplest, most delightful snack. This peaches and cream ice cream is summer in a bowl. It comes together easily and just the thing you need to cool off as summer sweeps in. One – the recipe requires only 5 ingredients. Two – it’s a no-churn recipe. I like to soak the peaches in sugar for about an hour before pulsing them into a puree. The sugar softens the peaches and draws out some of the moisture, making it easier to blend them. The puree needs to be heated for about 5 minutes to reduce the liquid. This will also enhance the peach flavor. What’s peaches and cream ice cream without a strong sweet peachy flavor? Stir the peaches, lemon juice, and sugar in a medium-sized bowl to combine. Set aside until a syrup accumulates in the bowl, about 1 hour. Add the peaches and syrup to a blender and pulse until almost pureed, just enough to break down the large pieces. Transfer puree to a medium saucepan. Heat over medium-high heat until reduced and thickened, about 5 minutes; stir occasionally. Transfer to a bowl and refrigerate until cold, about 2 hours. Add the heavy cream to a large bowl. Using an electric mixer beat until stiff peaks form. Turn the speed to low and slowly pour in the condensed milk. Turn the speed back up to high and beat until thickened. Transfer 2 cups of the whipped cream to a separate bowl. Add in the puree and mix until well combined. Fold into the remaining whipped cream. Transfer to a freezer-safe container and freeze for at least 6 hours. Plan ahead for this recipe! The peaches need to sit in sugar for 1 hour before pureeing and reducing. Once the puree is cooked down it needs to be chilled before adding it to the ice cream base. This process takes a little bit of time. Once the ice cream has been mixed together, it needs to freeze for at least 6 hours. Whenever ice cream is frozen too solid, I like to run my scoop under hot water, wipe it off, then scoop a scoop. The hot scoop should glide right through the ice cream. I tried this with some high quality peaches, it turned out but found it too sweet. I like the tartness to keep it fresh tasting. Will reduce the condensed milk and if it turns out next time. Hi Jen, Is there a substitute for the electric mixer in this recipe ? And when you say heavy cream, can we use a 30% heavy whipping cream or a regular heavy cream? If you don’t have an electric mixer, you can try whipping it by hand. Keep in mind it takes longer to whip by hand. I used heavy whipping cream, but you can use either. Whipping cream tends to whip up softer and fluffier so the ice cream will be lighter in texture. Thank you so much. Will give it a try. 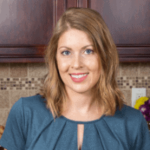 Hi Jen, I was wandering, can I use home made condensed milk and homemade heavy cream for this recipe. I haven’t tried making it with homemade condensed milk and homemade heavy cream, but I imagine it would do just fine. Drain the peaches reserving 1/2 cup of the syrup. You won’t need the lemon juice or sugar. Canned peaches are usually fairly sweet. Add the peaches and reserved syrup to the blender and continue with the steps in the recipe. Hi ….. I was just wondering can you use canned peaches??? You’re absolutely right, Jen – I need this! Well, I’ve grabbed a large soon and ready. Oh, I didn’t mention that I anticipate you would send me some to sample! 🙂 Lovely ice cream! I am loving all the peach goodness in this easy ice cream!!! This ice cream sounds amazing! We live in peach country and the season is just starting. Can’t wait to try this recipe! I won’t just crave it all summer long…all YEAR LONG!! Beautiful. 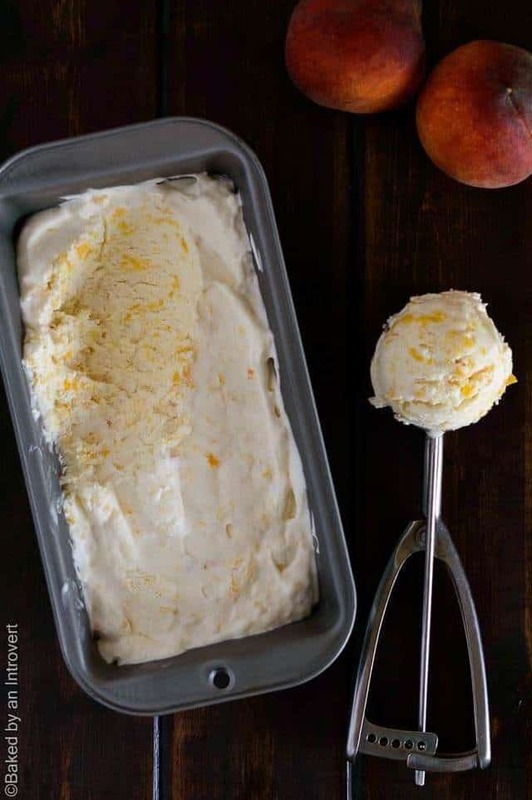 I really have to give this trend of no churn ice cream a try, it seems to be such a big hit, and the peaches and cream flavor sounds too good to pass on. Jen, I LOVE this ice cream!!!! LOVE peaches!!! this looks so good!!!! making this this summer for sure!!! Thanks, Alice! It is so easy to whip up. Enjoy! I am ALL over no-churn, 5-ingredient ice cream and these gorgeous scoops are calling my name! This ice cream is the perfect way to use up all those summer peaches! I can hardly stand how ultra-creamy it looks! 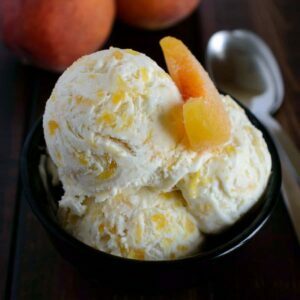 Peach is my absolute favorite flavor of homemade ice cream – I’m so excited to have a no churn version to try!! I think you will love it, Marissa! Enjoy! I love peaches in ice cream! They are so nice, fruity and fresh and perfect for summer! Love this! Love no churn ice cream and this one looks fantastic! Great flavors, pinned! Thanks for the pin my friend! There is nothing better than peach ice cream. This looks fantastic! Thanks, Jocelyn. Peach anything is a win! That ice cream does look like summer in a bowl! What perfect looking ice cream – I seriously need to try this no churn ice cream that I’m seeing everywhere – it all looks amazing! Yes, you should try it! It’s way too easy and turns out delicious every time. I love easy no-churn ice cream recipes, they are just the best. I love that you added peaches in too, such a perfect treat for summer! No churn ice creams really are the best! Thanks, Danielle! I’m so jealous of your peach tree! We planted an apple seed that sprouted, surprisingly. So I’m trying it with a peach pit now. No signs of a seedling yet, but I’m hopeful. Enjoy the ice cream! Looks delightfully delicious! I have a box of nectarines…do you think I could use those instead of peaches? Susan, you can use any fruit that your heart desires. Nectarines sound fabulous. Enjoy! This looks so impossibly creamy and rich! I love it – the perfect summertime ice cream flavor! I love making no-churn ice cream! It’s so easy and so delicious. Peach ice cream is one of my favorites so I’m loving this, Jen! Sounds like the perfect summer treat! Thanks, Gayle! It’s definitely way too easy not to make it! I love no churn ice cream! I really don’t feel the need to pull out my ice cream maker when you get such fantastic result without it! Love the peachy flavor in this ice cream Jen, looks amazing! That’s exactly right, Manali! And it’s too easy! It has been insanely hot and humid lately, so I NEED ice cream! 🙂 This is perfect! I cannot get enough peaches right now! Thanks, Annie! This would be the perfect way to cool off! I am so making these!! Looks so creamy and I love no churn ice creams! I’m all about some peaches right now. This peaches and cream ice cream is perfect for summer and no churn makes it so much easier! Fresh and delicious! Love the easy ingredient breakdown. Thanks, Kelly! Peaches are the best, aren’t they? I’ll happily pass you a double scoop! Five ingredients? Heck yes! And I’m all things peaches right now. Like, ALL the things. They are my favorite summer fruit! Pinning this! Thank you so much for the pin, Mary Frances! Enjoy! I am recipe testing for a no churn ice cream right now. Yours looks like the perfect summer treat! Thanks, Sarah! I can’t wait to see what you come up with! There’s a local ice cream shop that makes a deliciously creamy frozen yogurt with peaches. This looks so good. I love how creamy it is and how simple the recipe appears. Thank you! Thanks, Erin. I hope you give it a try! 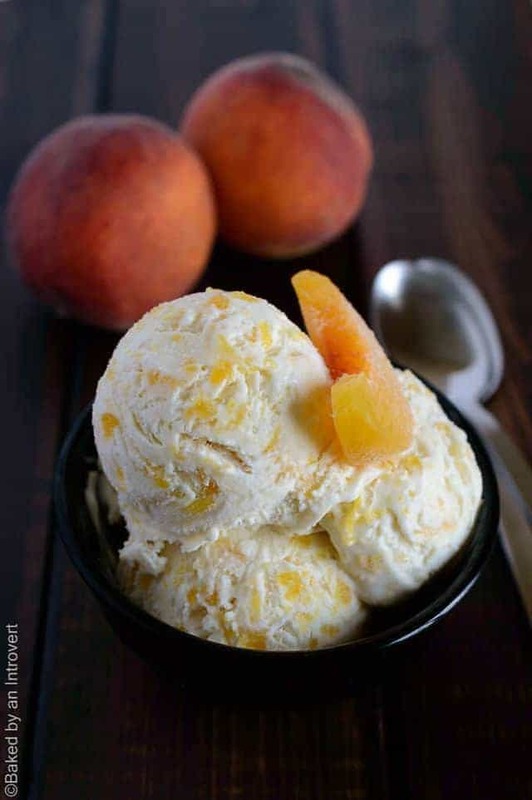 You had me at ‘no churn!’ Peach Ice Cream was my favorite homemade flavor growing up. I will have to give this a try!!! Definitely give it a try! Enjoy! I can’t help not try this at home. So excited to make this. Thanks for the tips!